The Nokian Hakkapeliitta winter tires are designed for challenging environments where the road conditions can vary from sleet to snow and icy roads. Nokian Tyres is actively developing a new winter tire technology that enables safe transport even at northern latitudes. One example of the new approach to winter tires is the concept tire that combines the driving comfort of non-studded winter tires with studded tires’ superior grip on ice and slushy roads. ‒ Under varying winter conditions, the driver could bring out the studs of the winter tire at the push of a button before braking or whenever a firmer grip is needed. The development of the concept tires is still underway but this innovation gives some idea of what kind of tires we might be driving on in the future, explains Juha Pirhonen, Vice President, Research and Development at Nokian Tyres. "Under varying winter conditions, the driver could bring out the studs of the winter tire at the push of a button before braking or whenever a firmer grip is needed." The manufacturing of the Nokian Hakkapeliitta tires started in 1936, and they became internationally known at the legendary Monte Carlo rallies in the 1950s and 1960s. The cars equipped with studded Kometa-Hakkapeliittas dominated the snowy and icy mountain roads. Tires have improved immensely from the days of the Kometa, and modern stud technology maximises the handling and driving comfort. The modern Eco Stud 8 concept also addresses the needs of the consumers and the environment better than before. - Even though we were able to increase the number of studs, the new generation of studs has lower road wear than the previous models, which also reduces the amount of road dust, says Matti Morri, Technical Customer Service Manager at Nokian Tyres. The innovative stud includes several properties that are the result of years of careful development work. - The flange helps the anchor stud to firmly bite into the road, ensuring grip under slippery and challenging road conditions, while the stud cushion adds a spring effect that dampens the road contact. This improves the driving comfort and is also good for the environment, Morri explains. Handling and stability under surprising conditions are based on the tire’s longitudinal and lateral grip on ice, which is improved by the new stud distribution as well as the stud design. The stud technology that improves control under extreme conditions is featured in the Nokian Hakkapeliitta 8 winter tires that have succeeded in tire tests around the world. These state-of-the-art studded tires were used for the incredible world record for the fastest car on ice at 335.713 km/h. In addition to the studded tires, we have improved the grip properties of Nordic non-studded winter tires as well. The Nokian Hakkapeliitta R2 features the Cryo Crystal concept that significantly improves the grip on slippery roads and ice. - The invention is based on microscopic diamond-hard particles in the rubber compound that resemble crystals. The tough, multi-edged particles are eco-friendly and function almost like built-in studs, Morri describes. Nokian Tyres has a broad view on safety. The development efforts address consumers’ requests and needs. According to Pirhonen, product development has extended the service life and improved the fuel economy of the tires, making them easier on the wallet. - Sustainable safety, for example, means that a tire’s properties need to remain virtually unchanged throughout its service life. It is important to communicate to the drivers when the wear starts to affect the safety of the tire, Juha Pirhonen explains. The best inventions are often ingeniously simple but functional, like the Driving Safety Indicator (DSI), patented by Nokian Tyres. It allows the driver to see the remaining tread depth of the tire’s main grooves. The patented invention improves safety, and we use it in our summer and winter tires. When tread depth gets below 4 mm, the tires should be replaced in order to ensure safety. Our successful product development was recognised internationally when the new Nokian Hakkapeliitta R2 winter tire won the esteemed Tire Technology of the Year 2016 award. - Our Nokian Hakkapeliitta R2 is the world’s most energy-efficient tire and the first winter tire with the class A rolling resistance rating. 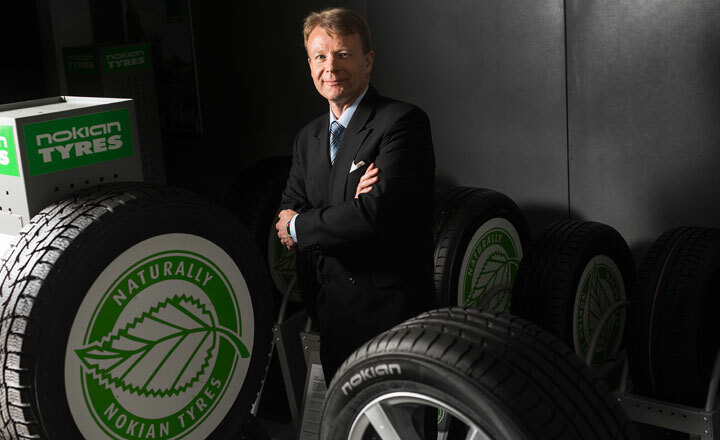 The non-studded tire is especially designed for improving the range of electric and hybrid cars but, for drivers of petrol and diesel cars, the low rolling resistance means reduced fuel costs and CO2 emissions in addition to the pleasantly low rolling noise, Pirhonen says. What is next in store in the research and development of tires? – Eco-friendliness continues to guide our future product development. The Nokian Hakkapeliitta tires use new kinds of rubber compounds that reduce fuel consumption and CO2 emissions. We are already using renewable raw materials, including canola oil and pine oil, because canola oil, for instance, improves the rubber compound’s durability and grip on ice, explains Vice President, Research and Development Juha Pirhonen. Technical Customer Service Manager Matti Morri envisions that the largest leaps will be taken in stud technology, in particular, as well as improved tread compounds. The aim is to give drivers even more peace of mind – regardless of the road conditions they face. How was the world's first winter tire invented?